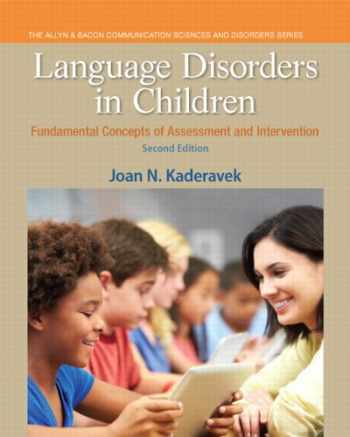 Acknowledged author Joan N. Kaderavek wrote Language Disorders in Children: Fundamental Concepts of Assessment and Intervention (2nd Edition) (Pearson Communication Sciences and Disorders) comprising 464 pages back in 2014. Textbook and etextbook are published under ISBN 0133352021 and 9780133352023. Since then Language Disorders in Children: Fundamental Concepts of Assessment and Intervention (2nd Edition) (Pearson Communication Sciences and Disorders) textbook received total rating of 3.5 stars and was available to sell back to BooksRun online for the top buyback price of $75.69 or rent at the marketplace. This text is more than an introductory look at language disorders. It goes beyond basic concepts and basic definitions to teach students how to analyze, synthesize, evaluate, and link the information they are learning. It offers readers opportunities for higher-order learning, while preparing students to become careful evaluators of information, as well as adept problem solvers. Organized by disorder groups and theme, Language Disorders in Children, 2/e helps students easily make connections between theoretical information and clinical practice through a number of thoughtful features such as case histories, clinical decision trees, and hot topic discussions. It’s an approach that meets the needs of today’s students to learn lifetime critical thinking skills, to see relationships between isolated ideas and facts, and to think like a speech-language pathologist.